Not often does a filmmaker get the chance to have a second go, to make the same film twice, but that is exactly what has happened for Ken Scott. In 2011 Ken Scott released Starbuck, a French-Canadian film about a man, David Wozniak, who in his youth, under the pseudonym ‘Starbuck,’ donated frequently to a sperm bank and through a clerical error ends up becoming the biological father to 533 children. Two years later, Scott is in Hollywood making Delivery Man, where Vince Vaughn plays David Wozniak, who in his youth, under the pseudonym ‘Starbuck,’ donated frequently… you get the idea. Hollywood has a history of remaking successful foreign comedies for an American audience that can’t be bothered reading subtitles, but this is a scene-for-scene, shot-for-shot, joke-for-joke remake. While Starbuck was a bit of a critical darling, doing quite well at a number of film festivals, the remake lacks some of the freshness of the original. Given this is Scott’s second shot at making this film it is odd that Delivery Man feels like a movie made off a first draft script. The screenplay is incredibly uneven. There are some passages which are quite sharp and well executed, while others really drag. There are also jarring changes in tone throughout the film. One moment we are giggling at a montage of David going to great lengths to secretly get to know his children –taking and re-taking historical tours, drowning in a public pool to get rescued, helping a drunken young man get home safe from a big night out – and the next moment we watch him trying to process the fact that one of his sons, Ryan, has severe cerebral palsy. The scenes with Ryan are among the most touching in the film, but they don’t sit easily with the scenes around them. This lack of assuredness in the storytelling also manifests itself in some annoying and unnecessary subplots. David trying to prove to his pregnant girlfriend he is father material at the same time as dealing with the discovery he already has 533 children is more than enough story to satisfy a 90 minute comedy. We don’t need the extra 20 mins that comes from David being in severe debt to angry loan sharks and growing pot to help pay them off. Rather than adding drama, it just distracts from it. 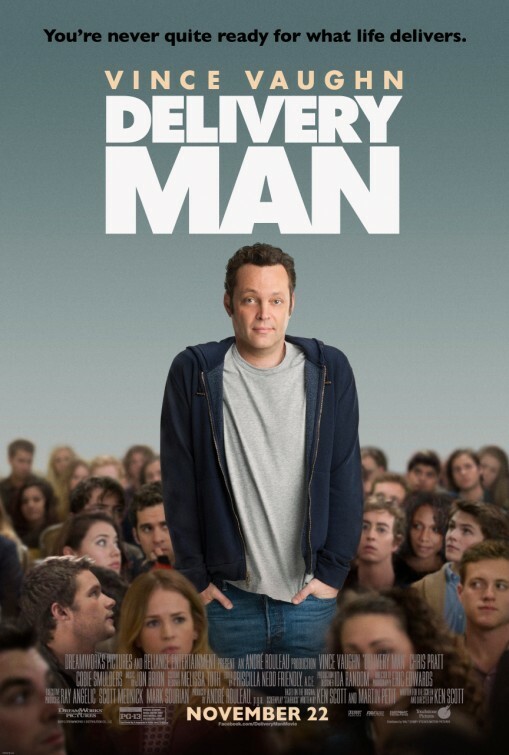 Delivery Man has some laughs, though not as many as you might expect. Chris Pratt is particularly funny, though I don’t know if anyone can really believe him as a lawyer. For Vince Vaughn this film is the latest example of his transition from the obnoxious motor-mouth of Swingers and Wedding Crashers to sentimental middle-aged guy.